“By definition, Synergy is the interaction of elements that when combined produce a total effect that is greater than the sum of the individual elements, contributions, etc. ; synergism. I decided to have my candle burning while I had the world’s longest and most bubbly bubble bath. When I got out there was a perfect pool of wax melted and I used it as sort of a body lotion instead of my usual stuff. I massaged it in and my skin just soaked it right up. At this stage I still couldn’t smell the lavender but oh my skin was so freakin soft! I went to bed not long after and slept like a baby. This candle was very therapeutic indeed, I felt a lot better in the morning, probably from a combination of the essential oils, the heat and all the sleep. I’m going to use my candle in the future for when I’m stressed and need to relax a bit. This range of candles is available in a few different scents: Relax, Relief, Rejoice, Rest and Romance…oooh I bet we could do with one of each eh? Have you tried any products from Serenity Glow? Do you have any scent recommendations? Let us know in a comment below. Stay tuned for more reviews from us but until then check out Serenity Glow on Facebook and Instagram. 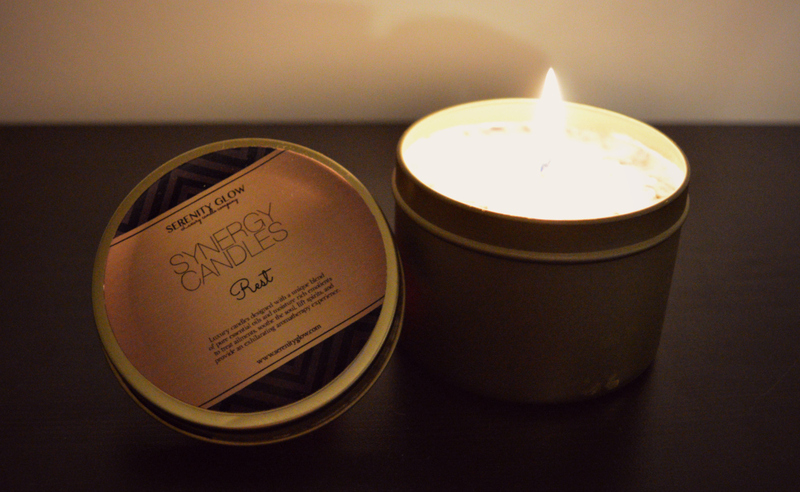 Potters Crouch Hawaiian Kona Candle Review from Sarah Lou Ltd.